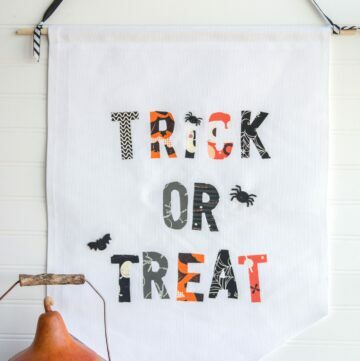 You are here: Home / Holidays / Halloween / DIY Halloween Treat Bags with Free Printable! 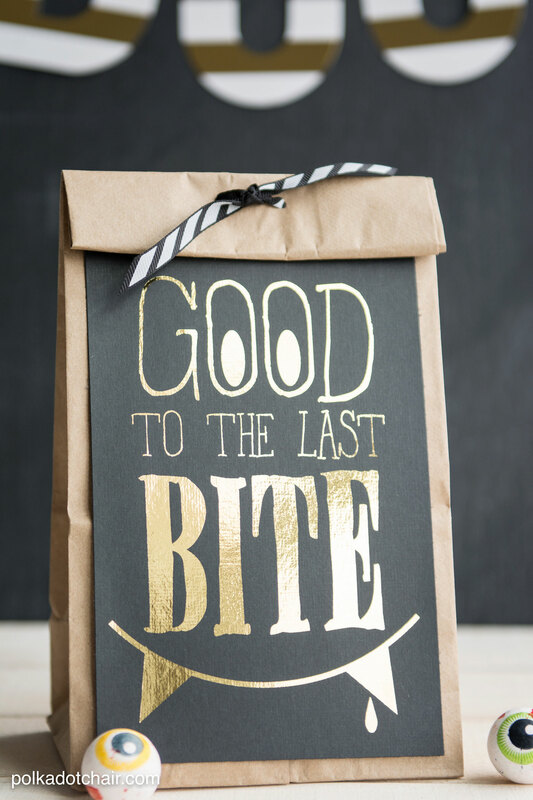 Are you planning to deliver treats to your friends and neighbors this year? Maybe you’re looking for a simple gift idea for a teacher or family member. 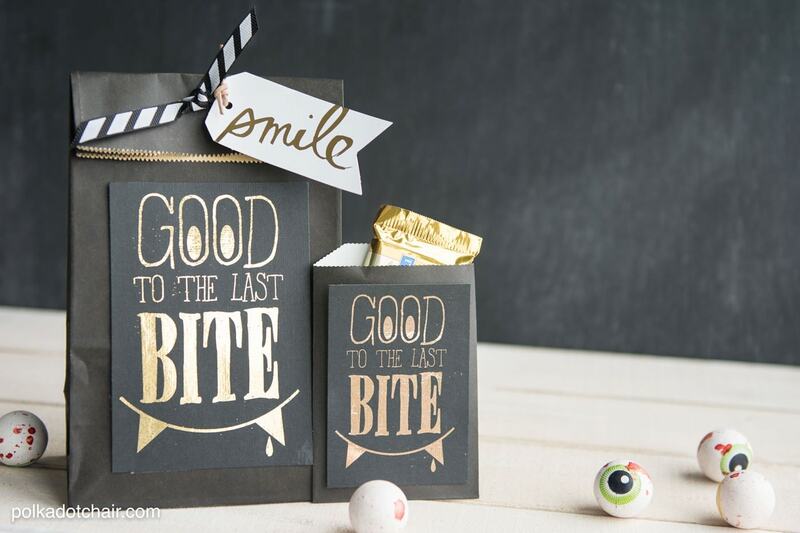 Then you may just love today’s project, these “Good to the Last Bite” DIY Halloween Treat Bag Ideas (the project includes a free Halloween printable too). 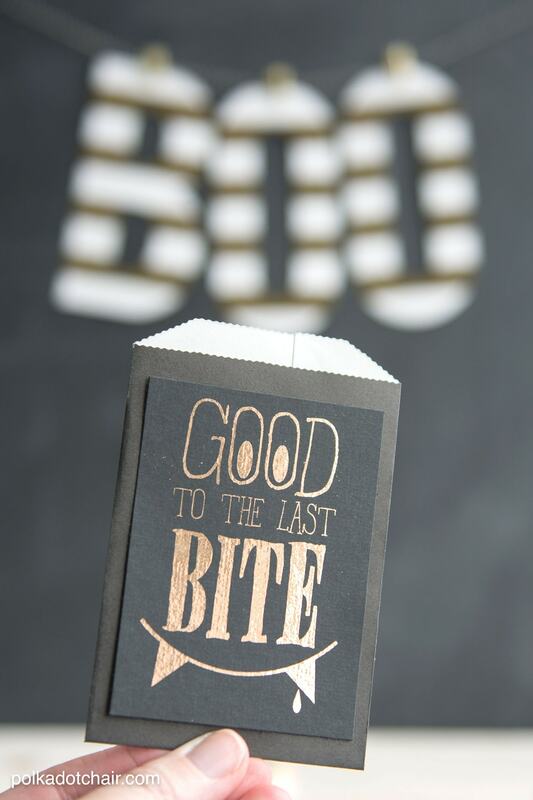 I “fancied” mine up a bit with a touch of gold foil using the #HSMinc machine. A big thanks to American Crafts for sponsoring this post, as always opinions are 100% my own and I’m thrilled to work with a company that I believe in. I have a great love for Halloween. Not the scary gory stuff, the fun creative family-friendly stuff. 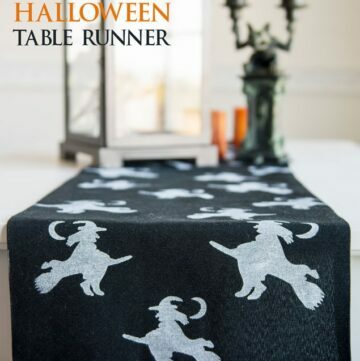 I adore decorating my home at Halloween and usually try to drop off treats to my friends and neighbors in honor of the holiday. The last few months I’ve been working with the new Minc Foil Machine from Heidi Swapp, you can see some of my previous projects HERE. 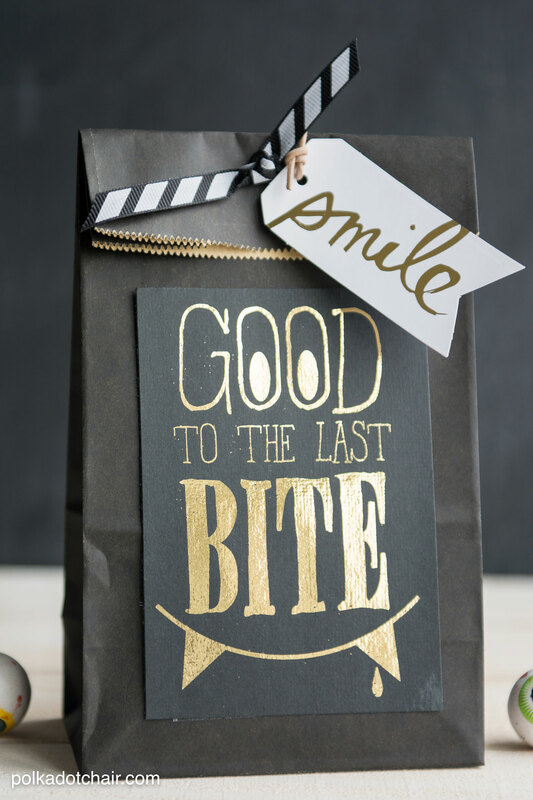 I thought for my project this month that I’d “fancy” up some simple lunch bags and turn them into cute treat bags for Halloween. My initial idea was to print directly ON the lunch bags. Let me tell you that is NOT an easy feat. I’m quite tech-savvy and after an hour of trying to get Acrobat and my Printer to be “friends” I just gave up and realized that this project is MUCH easier if the image is printed on cardstock first. Also knowing that I was going to share this printable with all of you, I wanted to keep it as SIMPLE as possible. I created the printable in 3 different sizes, 5×7, 4×6 & 3×4. One of those sizes should fit on the treat bags that you are making. Also, I think this would be tote adorbs as a sign on a buffet table at a Halloween party. The tiny one seems just right for a nice piece of chocolate or two. 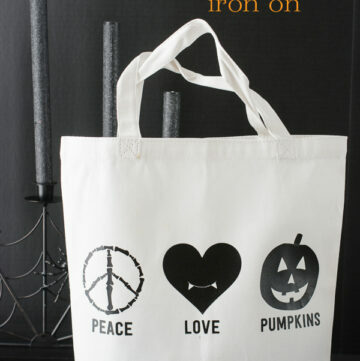 FYI: If you don’t have a foiling machine you can just print them in black and white and attach them to pre-printed Halloween Lunch Sacks. -Laser Printer if you want to add foil – or just take it to your local copy shop, inkjet printers don’t work with the foil – also a little PSA, laser printers are much less expensive to print than inkjets. The laser cartridges last longer and are less to replace than inkjet cartridges. If you mostly print in black and white you might want to think about it. 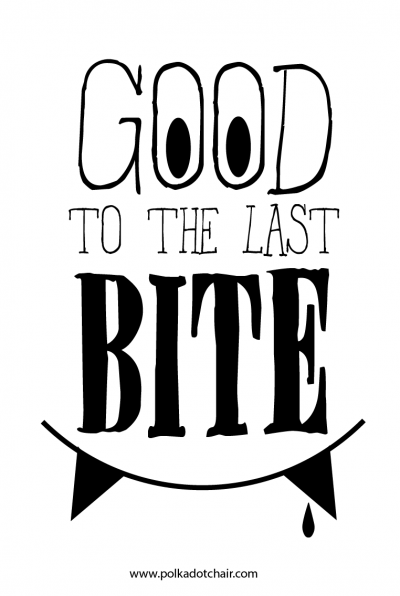 Print out the “Good to the Last Bite” Printable. 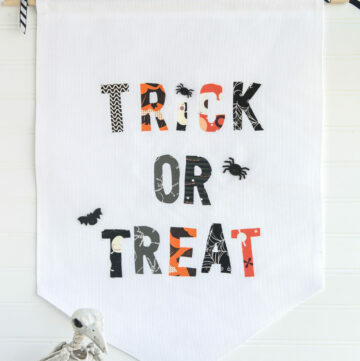 Download it over on the Halloween TEMPLATES page. 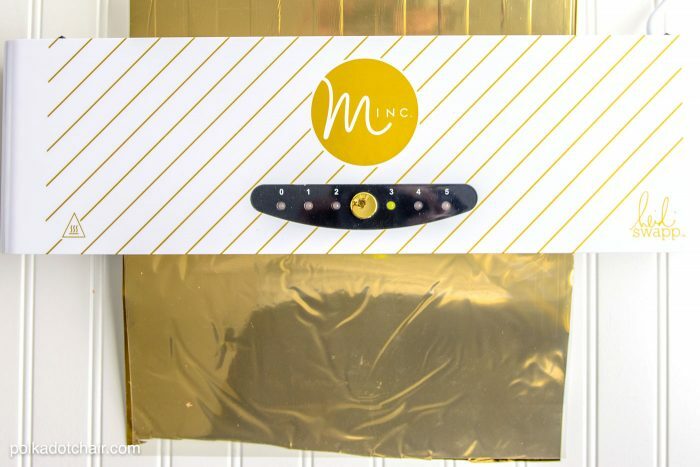 Cut the foil to size and run through the Minc machine at setting 3. If you need to know more about how to use the machine just click here for instructions. Then simply cut out and attach with double stick tape. Fold over the top of the lunch sack and punch two small holes. Feed ribbon through and tie. If you’d like to pick up a Minc. Foil Machine for yourself you can find them at your local craft stores, online and at Amazon. 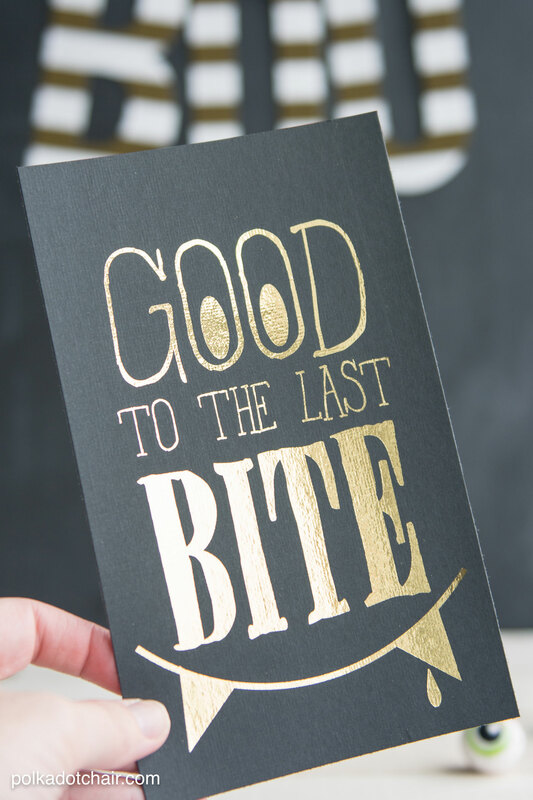 Oh, I wish your free printable was in gold. I could print it on a color laser printer. We’ll probably print in black on white card stock. It will still be cute! Thanks! Hi, So cute! Your download requires a password and I looked but couldn’t see one. Help please! There are instructions at the top of the templates page that walk you through it. I am trying to print this on your templates page for a party tomorrow morning at 7:00 am. It’s requesting a password? Hi! 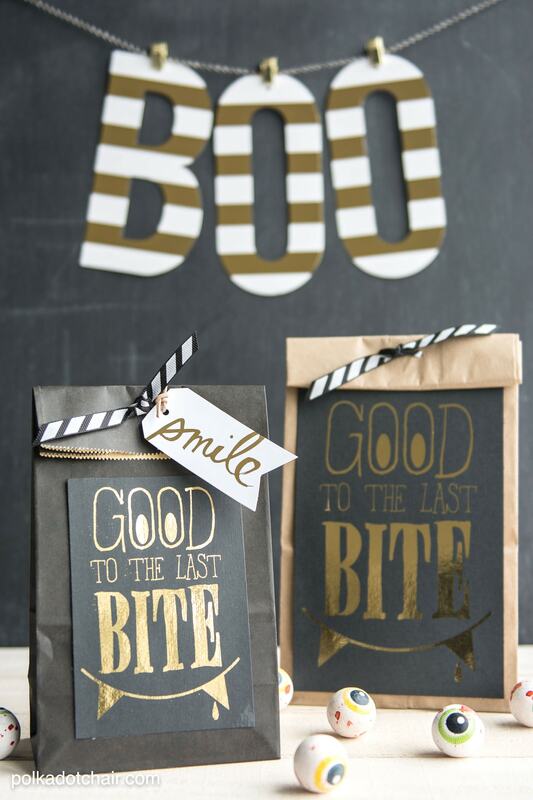 The lunch bags are adorable, and I was wondering if you offer (or will offer) a printable for the “BOO”. It’s in the pictures, but I couldn’t find it on your site.